Powers/Abilities: Good fighter, skilled with a garotte. Carries a rubber knife which dispenses fake blood, used to fake suicide if she is about to be captured. Skilled practioner of magic. 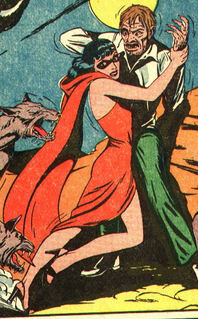 History: After her fiance was slain when the Nazis sunk the ship they were on, the woman who would become Lady Satan swore vengeance, and became a resistance fighter, proving to be both resourceful and ruthless. Having learned magic at some point, after the war Lady Satan fought supernatural menaces (see Comments). Comments: Created by George Tuska. Various sites say Chesler had two Lady Satans. However, given no contradictory backstories (mainly because we got very little background info on either), and identical costumes (there are images of both versions on this page - can you tell which is which? ), I take the view that it is the same woman - she just learned magic at some point.